Time/Date Relevance: (highest) 2017 – 2018, (medium) 2019, 2020. Primary Audience: Business Leaders, IT leaders, CDO, CIO, CTO, Analysts, Journalists, Business/Technology Consultants. 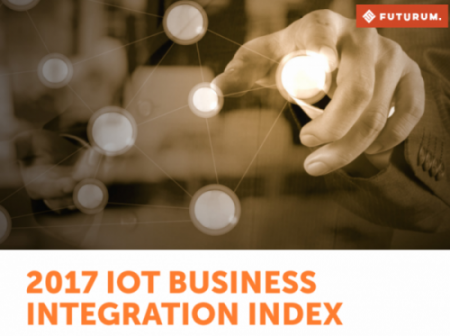 This 21 page report is based on Futurum’s research and insights into the 2017 state of IoT business integration in the United States. Findings, particularly regarding current business leadership perceptions of the IoT, should inform intent, behaviors, and trends relative to IoT adoption, investment, and strategic opportunities for the next 3 years (2017-2020). Methodology: Hundreds of business leaders and decision-makers located in technology clusters around the US (from Silicon Valley, CA to Raleigh-Durham, NC and Boston, MA) were asked about their respective companies’ relationship to the IoT. The survey included questions about current adoption and implementation trends, investment intent, and perceived opportunities and concerns for the next 3-5 years. Confidence in the value of individual IoT categories, as well as perceived brand/company leadership in the IoT, were also gauged in the survey. 92.9% of surveyed businesses are interested in the value that the IoT might bring to their organizations over the next 3-5 years. Only 7.1% of businesses reported not being interested in the IoT at all. 68.5% of surveyed businesses intend to increase their investment in the IoT over the next 3-5 years. Areas of greatest interest for IoT integration are operational efficiency, resource optimization, revenue increase, and corporate image/reputation. Areas of greatest concern for organizations are cost, security, complexity, and compatibility/interoperability. solutions will prevail, at least initially), articulating their solutions’ net positive cost-to-value propositions (ROI), and appeasing concerns about cybersecurity relative to the IoT. 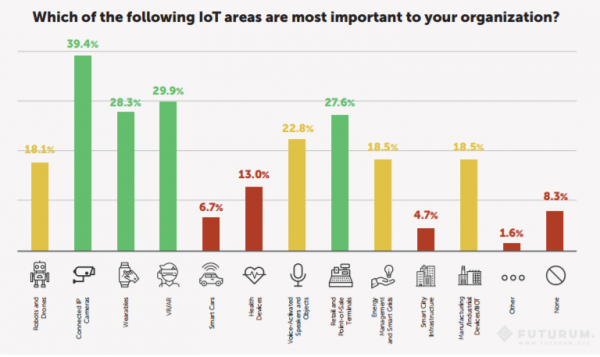 IoT categories currently generating the most interest from businesses are connected IP cameras, VR/AR, wearables, retail and point-of-sale terminals, voice activated speakers and objects, and manufacturing and industrial devices (IIoT). 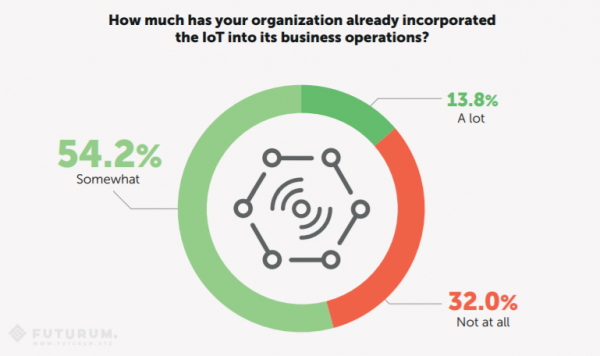 Over two thirds (68%) of surveyed organizations report having already incorporated IoT solutions into their business operations. Only one third (32%) of respondents report no IoT integration whatsoever. to be far ahead of their competition. Only 10.8% admit to their IoT expertise being far behind their competition. Download the report for more data and insights. 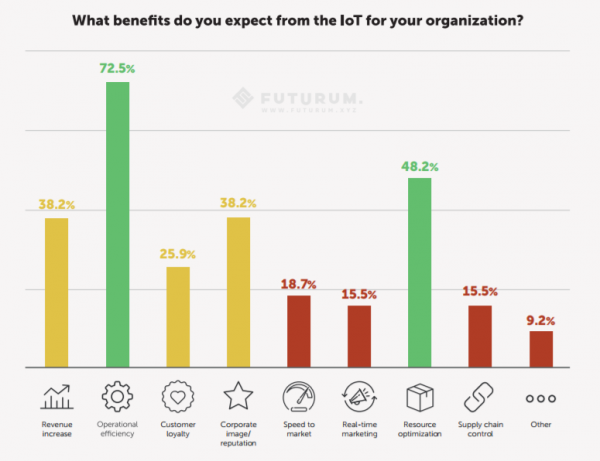 Non-digital Media: This report and all of its contents may be shared and/or used as reference material in news articles, blog posts, social posts, and reports about the IoT, Technology, and Business, with proper attribution to: Futurum Research. Digital Media: For all electronic and digital publications, please provide attribution to Futurum Research and a hyperlink to the report. 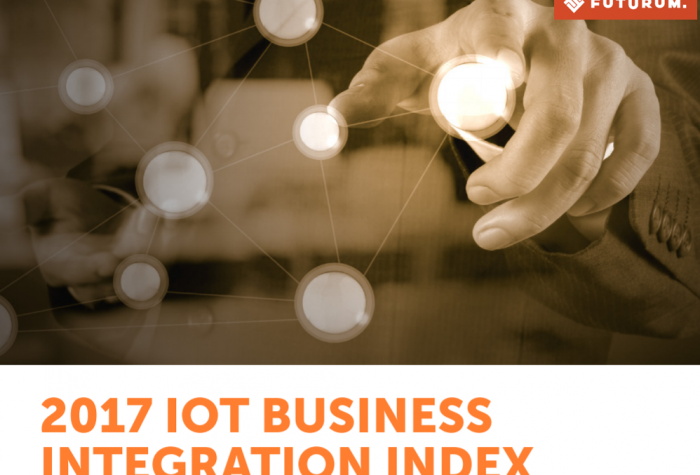 The title of the report is: The Futurum 2017 IoT Business Integration Index.